CHURCH OF JESUS CHRIST OF LATTER-DAY SAINTS — All members and friends are invited to participate in the 182nd Semiannual General Conference. Messages will be given by the First Presidency and other leaders of the church. 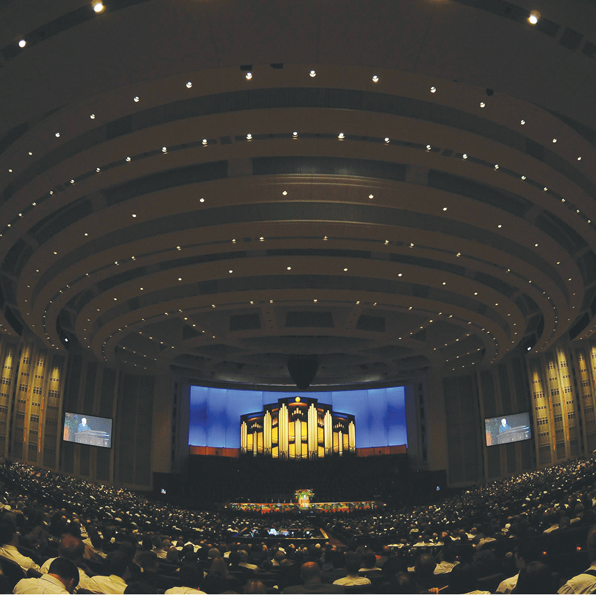 General sessions will be held on Saturday, Oct. 6 at 11 a.m. and 3 p.m. and Sunday, Oct. 7 at 10:30 a.m. and 3 p.m. Go to Conference.lds.org to watch live or Byu.tv or Mormonchannel.org. Broadcasts will be available at the LDS chapels: Zachary Ward, 4901 Hardin St. in Baker and Denham Springs Stake Center, 25367 Riverton Ave. in Denham Springs. Friday, October 5 • Selective Hearing Anniversary • 9 a.m. to 4 p.m. Selective Hearing is hosting a special 2nd Anniversary event at their office, 6110 Main St., Ste. D. There will be a free hearing screening, free clean and check of your hearing device, free pack of batteries for any hearing aid user, free “Hear the Tigers Roar” t-shirt while supplies last, and demonstration of bluetooth technology. Register for door prizes. For information, call 243-6129 or 1-877-358-6130. The SPCA of Livingston is hosting it’s annual BowWowWeen Pet Costume Contest during FallFest in the Denham Springs Antique District. Registration forms can be picked up at Pawticular Pets in Denham Springs, Smooch My Pooch in Central, and Faithful Companions in Livingston. For information, contact Jennie Vancel at 456-3978. October 5 through 7 • The Little Mermaid Jr.
Playmakers will present Disney’s “The Little Mermaid Jr.” at the Reilly Theatre on the LSU Campus. The musical is presented by the Playmakers Young Professionals. Performanes are Friday, Oct. 5 at 7, Saturday, Oct. 6 at 11 a.m. and 2 p.m., and Sunday, Oct. 7 at 2 p.m. Tickets are $12. For tickets or information, call 578-6996 or visit www.playmakersbr.org to purchase tickets online. The Tri-Parish Ballet will hold auditions for The Nutcracker at Odyssey Academy of Dance, 31342 Hwy. 16 in Denham Springs, for children seven years through advanced dancers. More than 100 children will be selected to perform with the Houston Ballet II. Audition times are: 1 p.m. boys, 1:30 p.m. girls 7-9, 2:30 p.m. girls 10-13, 3:30 p.m. girls 14 and up, and 4:15 p.m. advanced dancers. For information, call Odyssey Academy of Dance at 665-3414 or email triparishballet@aol.com. The Pumpkin Patch is coming! Blackwater United Methodist Church, 10000 Blackwater Rd., is once again hosting its incredible Pumpkin Patch with literally thousands of pumpkins for sale! All sales profits go to benefit missions supported by the church. Featured will be games, hay rides, car show, crafts fair, space walk, and many other activities. Bring the whole family. No admission! For information, call 261-4646 or visit www.blackwaterumc.org. Thursday, October 11 • Masquerade at the Mansion • 7:30 to 11 p.m. The 14th Annual Old Governor’s Mansion Gala’s theme this year is “Masquerade at the Mansion” and attendees will celebrate Louisiana’s Spanish legacy from 1762-1810. The event will include the lively sounds of Stormy in The Rose Garden, while guests peruse the East Ballroom for the silent auction extravaganza and specialties, all the while sampling Louisiana and Spanish delicacies from the area’s finest caterers and restaurants. Tickets are $100 per person for Foundation for Historical Louisiana members, $125 for non-members, and $50 for those under 35 who are invited to join FHL’s junior group, “Inherit Baton Rouge.” For tickets, membership, and information, call 387-2464 or go to www.fhl.org. Saturday, October 20 • Pumpkin Patch Car Show • 10 a.m. to 2 p.m.
Exhibitor spaces are available for the third annual Pumpkin Patch Car Show at Blackwater United Methodist Church, 10000 Blackwater Rd. Open reservation ($20) will begin at 8 a.m. the day of the show. For information, contact Ben Browning at 261-2546, John Dixon at 261-7557, or Blackwater United Methodist at 261-4646. Wednesday, October 24 • Dana Leong In Concert • 7:30 p.m.
Composer/cellist/trombonist dana Leong and his trio will perform at the LSU Union Theater. Leong blends jazz, classical, and pop to create a signature sound. Tickets are $36 to $44 and may be purchased online at www.uniontheater.lsu.edu or by calling the box office at 578-5128 Monday through Friday 10 a.m. to 4 p.m. For information or group discounts, call Terry Serio at 578-6013 or email tserio@lsu.edu. Blood Creek Manor Haunted House, 6010 Wet Creek Ave, Greenwell Springs, will be open to the public on Friday, Oct. 26 and Saturday, Oct. 27, 7 to 10 p.m. and Halloween night, Oct. 31, 7 to 9 p.m. There will be a Trick or Treat hayride and fun small child activities on Halloween night, 6 to 8 p.m. Cost: $5 minimum donation. A portion will be donated to Lawson Hebert and his family. Non perishable food items will also be collected for the Central City Food Bank. Saturday, October 27 • Pumpkin Patch Craft Show • 8 a.m. to 5 p.m. The Pumpkin Patch Craft Show will be held at Blackwater United Methodist Church, 10000 Blackwater Rd. Booth rental is still available, with indoor booths and electricity available. For information, contact Jo Anne Lewis at 261-4646 or Joanne@blackwaterumc.org. Saturday, October 27 • Benefit Golf Tournament • 8 a.m. to 2 p.m.
A four-man Scramble Golf Tournament will be held at Fennwood Country Club, 6003 Fennwood Dr., Zachary, for Michael “Keith” Crochet. Cost is $400 per team; $450 Gold Sponsor team and ad at hole; $100 Silver Sponsor ad at hole; $20 per person for hole in one. Breakfast and lunch to be provided. Auction and raffle. For information, contact Brenda Yarbrough at 954-0865 or Yogi Doyle at 933-6794. The Istrouma High Class of ’77 proudly presents Rock-n-Reunion, a gathering for all 70’s grads at Reflections, 9230 Cortana Place. Tickets are $75. Ticket includes unlimited buffet, beer, wine, and frozen drinks. Cash bar and security will be provided. Music provided by Riptide. Contact Debbie Armoney at dbueche12@yahoo.com or 261-6790. October 29 and 30 • Central Private Biddy Ball Camp • 3:30 to 5:30 p.m.
Central Private will hold a Biddy Ball Mini-Camp at the Central Private Gym. Players will receive coaching from Henry Gantz and players from both district championship boys and girls teams. Cost is $40. For information, email hhgantz@gmail.com.